An excellent and easy to use resource. This has been my favourite hanja resource for a number of years and to such an extent that I recently ordered a second copy. The book is organised in stroke order which means characters easily be found especially if you are familiar with the radical. Each character’s stroke order is provided plus a number of examples given highlighting the use of the character. 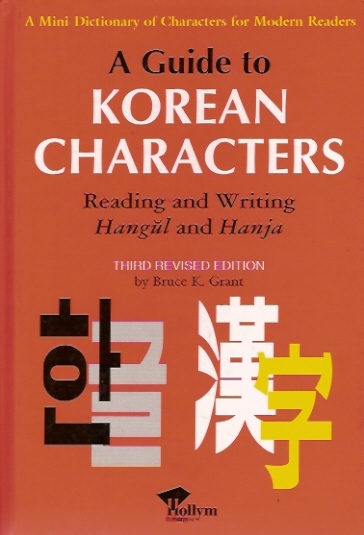 The book lists the 1800 characters (basic 1 stroke through to 26) taught in Korean schools. In addition, there is an interesting introduction to the history of Chinese characters and an insight into the various types of characters. 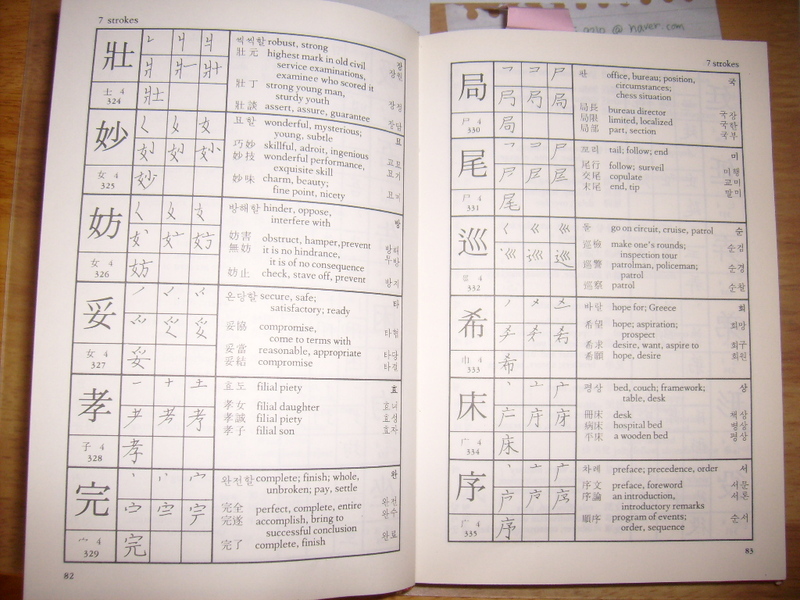 The author also provides a radical index and a list of the hanja characters associated with Korean family names. The book hardback and durable, and unlike some books I have bought in Korea, the quality of both the paper and printing is excellent. A glimpse inside the book. My photo doesn't do it justice! I originally bought a copy in Kyobo Books, Seoul, in 2002 and last year ordered a copy from Kyobo Books, in Daegu. My original copy cost 15000W (approx £8.80.) and the most recent copy was still 15000 won, something! I absolutely agree. It is the only way to learn the language beyond the beginner’s level, really. Korea was part of the Chinese civilization for its entire civilized existence until very recently and it is still effectively linked to China in many ways today, frankly, even if it now has everlasting links with more recently emergent English speaking North America. There is no understanding of Korean without understanding its dominant Chinese aspect. It’s really nice and all that they don’t write the Chinese characters as much now as they did in the past, but this has absolutely NOTHING to do with the fact that you must absolutely learn the characters and their associated native Korean meanings and Sino-Korean pronunciations in order to make either hands or tails of the Korean language! Either memorize everything in this book or go home and give up. That’s what I think at any rate. The book is perfect, cannot be improved upon, and teaches the language the way nothing else can. Putting the characters in stroke order is a brilliant idea as you see the simpler characters used (often as radicals) in the more complex ones later on in the book, which help to elucidate their meanings. Of course, the purpose of this is to understand the root words that all Korean words are made up of – both purely native Korean ones and the majority Chinese derived ones.